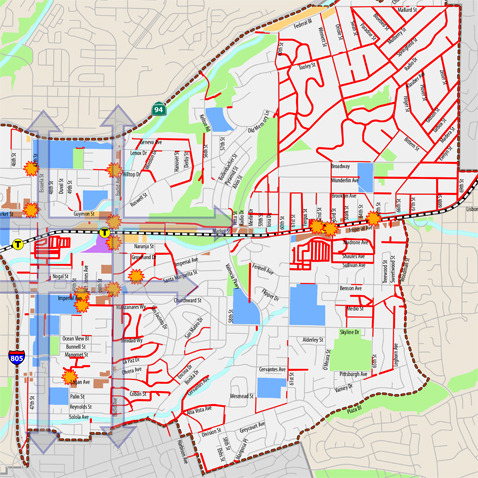 The Commercial/Imperial corridor is one of San Diego oldest neighborhoods—a culturally rich patchwork of homes, small businesses, industrial/warehouse uses and neighborhood-serving retail. Located just east of downtown, the corridor is well served by light rail, bus, and three highways. 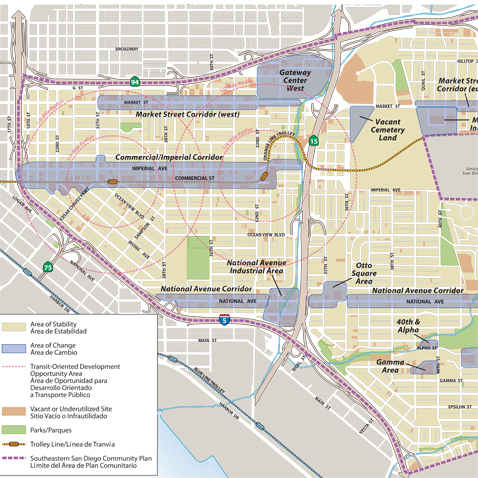 In 2008, the San Diego Association of Governments (SANDAG) designated the Commercial/Imperial corridor as a potential “Mixed Use Transit Corridor.” As a result, the city of San Diego applied for and was awarded a “Smart Growth Incentive Program” grant to conduct a planning study to establish a vision for the corridor, identify potential development opportunities, and update development regulations to permit the desired mix of uses and densities/intensities. Dyett & Bhatia was hired by the City in March 2011 to prepare a Master Plan for the corridor. The project includes a comprehensive public outreach program engaging both English and Spanish-speaking community members through community workshops, an advisory committee, a community character survey, project website, and an interactive charrette. The Master Plan will address potential collocation impacts between industrial users and sensitive receptors; a need for more open space, jobs, and affordable housing; and development of a multi-modal transportation network, among other issues. The Master Plan is expected to be completed in Fall 2012.